Let’s have a show of hands: How many of you have been advised at some point in the course of your photographic journey to “tell a story with your images”? Okay, now how many of you actually have a clue as to what that actually means? That’s what I thought. Many photographers, with the best of intentions, parrot the “tell a story” advice simply because it sounded good when they heard it, but when pressed further, are unable to elaborate. Telling a story with a photo is easier when photographers can physically stage subjects and light to suit their objective (an art in itself), or in journalistic photography intended to distill the the essence of an instant with a connection to an easily inferred chronology: a homeless man feeding his dog, dead fish floating in the shadow of belching smokestacks, or a wide-receiver spiking a football in the end zone. This isn’t to say that we landscape photographers can’t tell stories with our images, or that we shouldn’t try. Nor does it mean that one photographic form is inherently more or less creative than another. It just means that the rules, objectives, advantages, and limitations differ from form to form. Nevertheless, simply advising a landscape photographer to tell a story with her images is kind of like a coach telling a pitcher to throw strikes, or a teacher instructing a student to spell better. Okay, fine—now what? First, let’s agree on a definition of “story.” A quick dictionary check reveals that a story is “a narrative, either true or fictitious … designed to interest, amuse, or instruct….” Okay, that works. The narrative part is motion. Your pictures need it. Narrative motion isn’t the visual motion of the eyes through the frame (also important), it’s a connection that pulls a viewer into a frame and compels him to stay. While narrative motion happens organically in media consumed over time, such as a novel or a movie, it can only be implied in a still photograph. And unlike the arranged or journalistic photography mentioned above, landscape photographers are tasked with reproducing a static world as we find it—another straightjacket on our narrative options. But without some form of narrative motion, we’re at a dead end story-wise. What’s a photographer to do? Every art form succeeds more for what happens in its consumer’s (the viewer or listener) mind than for what it delivers to the consumer’s senses. Again: Every art form succeeds more for what happens in its consumer’s mind than for what it delivers to the consumer’s senses. A song that doesn’t evoke emotion, or a novel that doesn’t paint mental pictures, is soon forgotten. And just as readers of fiction unconsciously fill-in the visual blanks with their own interpretation of a scene, viewers of a landscape image will fill-in the narrative blanks with the personal stories the image inspires. In other words, an image should offer a place for the viewer’s own story to unfold. Of course the story we’re creating isn’t a literal, “Once upon a time” or “It was a dark and stormy night” (much more effective in photography than literature, I might add) story. Instead, the image we make must connect with our viewers’ stories to touch an aspect of their world: revive a fond memory, provide fresh insight into a familiar subject, inspire vicarious travel, to name just a few possible connections. If we offer images that tap these connections, we’ve given our image’s viewers a reason to enter, a reason to stay, and a reason to return. And most important, we’ve given them a catalyst for their internal narrative. Bingo. Think about your favorite novels. While they might be quite different, I suspect one common denominator is a protagonist with whom you relate. I’m not suggesting that immediately upon finishing that book you hopped on a raft down the Mississippi River, or ran downtown to have a dragon tattooed on your back, but in some way you likely found some personal connection to Huck Finn or Lisbeth Salander that kept you engaged. And the better that connection, the faster the pages turned. And so it is with photography: Our viewers are looking for a connection, a sense that there’s a piece of the photographer in the frame. Because we can’t possibly know what personal strings our images might tug in others, and because those strings will vary from viewer to viewer, our best opportunity for igniting their story comes when we share our own relationship with a scene and let viewers find their own connection. What? Didn’t I just say that it’s the viewer’s story we’re after? Well, yes—but really what needs to happen is the viewers’ sense of connection between our story and theirs. If you focus on photographing the scenes that most move you, those scenes (large or small) that might prompt you to nudge a loved-one and say, “Oooh, look at that!,” the more you’ll see and the greater your chance of establishing each viewer’s feeling of connection. Whether you’re drawn to towering mountains, crashing surf, delicate wildflowers, or prickly cactus, that’s where you’ll find your best images. I’m not bewildered, I’m intrigued. Donald Fagen’s lyrics aren’t trying to tap my truth, they simply reflect his truth (whatever it might be). And even though I have no idea what he’s talking about, the vivid mental picture Fagen’s lyrics conjure (which may be entirely different, though no more or less valid, than your or his mental picture) allows me to feel a connection. You, on the other hand, may feel absolutely nothing listening to “Pretzel Logic,” while “I Want To Put On My My My My My Boogie Shoes” gives you goosebumps for KC and the Sunshine Band. Different strokes…. Returning from the abstract to put all this into photographic terms, the more your images are true to the world as it resonates with you, and the less you pander to what you think others want to see, the greater the chance your viewer’s story will connect with yours. 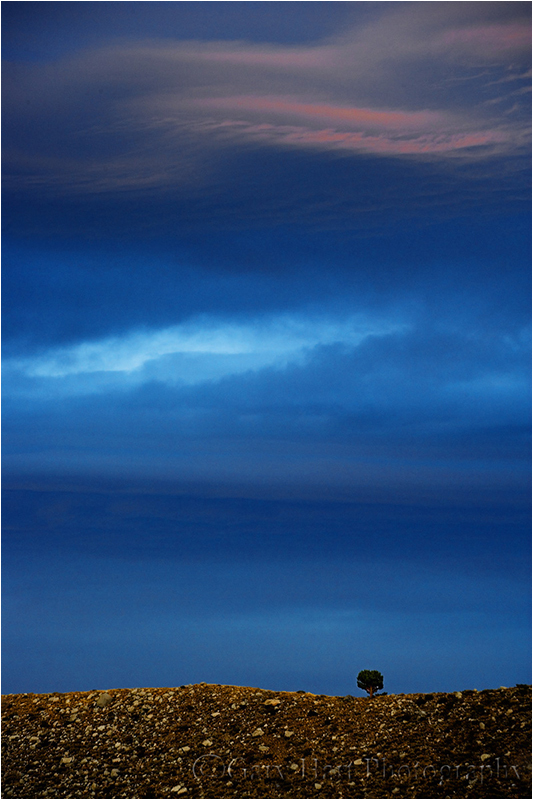 My own story of this solitary, ridge-top tree involved a frantic rush to capture a beautiful but rapidly fading sunset. I was with my brother on a dirt road in the Eastern Sierra. I’d been on this road many times and knew this tree well. Despite its rather ordinary appearance, the tree’s solitary perch atop a barren, rocky ridge had always intrigued me. I’ve always longed for a home with a sweeping view, and envied this tree’s perpetual 360 view of the Sierra crest to the west, the White Mountains to the east, and Crowley Lake below. 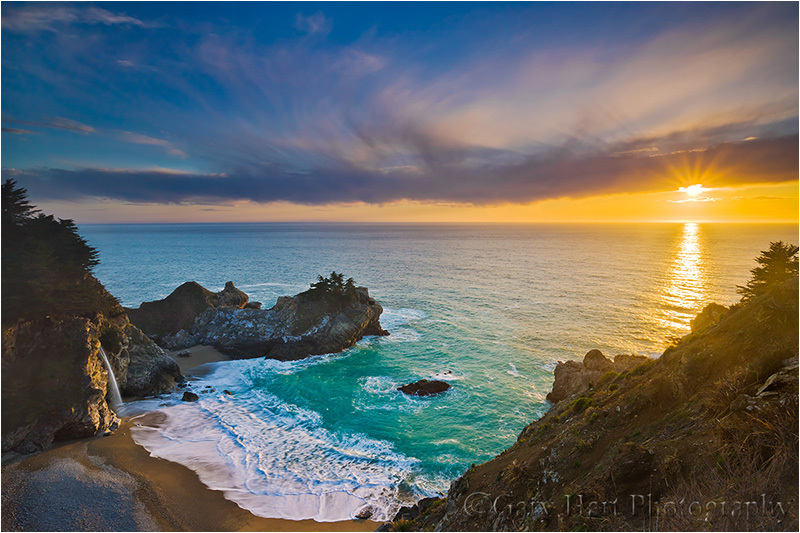 The humorous events leading up to this sunset at McWay Fall in Big Sur are nowhere to be found in the frame. Nevertheless, even after visiting this spot more times than I can count, I have a very personal connection to this moment in particular. There’s power in a plunging waterfall and crashing surf, and promise in the sun’s appearance above an infinite horizon. An early arrival allowed lots of time to connect with the scene, enabling me to anticipate the moment the sun burst from the clouds and balance it in the frame with McWay Fall. The position of the leading wave is no accident either—had I allowed it to reach the bottom of the frame before I clicked my shutter, it would have created a white line exiting the frame, taking your eyes right with it. That small strip of sand at the bottom of the image becomes a virtual frame that holds you in the scene. The rest is up to you. Those are my stories, and while they’re personally satisfying, I have no illusions that all of that comes across to the viewer. I’ve displayed these prints in many shows and watched people walk right by without breaking stride. But I’ve also been pleased to watch many people stop, linger, and return. While I have no idea what “story” these images (or any other) tap, I don’t think it really matters. Thank you for your insights in this article. First of all, I’m glad to know I’m not the only one out there trying to grasp the meaning of ‘telling a story’ with a still photograph. And secondly, thanks for the ‘permission’ to photograph scenes that ‘speak’ to me and the reassurance that those scenes may also speak to others. Perhaps not to all, but some may see the photographer behind the lens. I’ve enjoyed reading a number of your articles today. I got my introduction to your work through Leanne Coles’ Introductions series. You’re very welcome, Betty. Photography needs to be a source of pleasure—for some that pleasure is merely the accolades they receive for beautiful cliché images; others like to look a little deeper to share something a little more personal.